Advertising support played an essential part in the launch of the Festival Programme Book back in 1952 and was the cornerstone of the Glyndebourne Festival Society. Archivist Julia Aries looks back on how it all began – and we look back at some great and often humorous adverts – with many taking their artistic inspiration from Glyndebourne. For current opportunities read more here. By the beginning of the 1950s, the financial future of the Festival Opera was looking particularly bleak. Neither the newly-formed Arts Council nor the Treasury were prepared to provide regular funding and Glyndebourne needed a saviour – enter Nicholas ‘Miki’ Sekers. This hugely successful, self-made business man and arts lover fortuitously entered Glyndebourne’s orbit in 1950, with an extraordinary offer to provide all the fabrics necessary for a new production, free of charge, from his own West Cumberland Silk Mills. 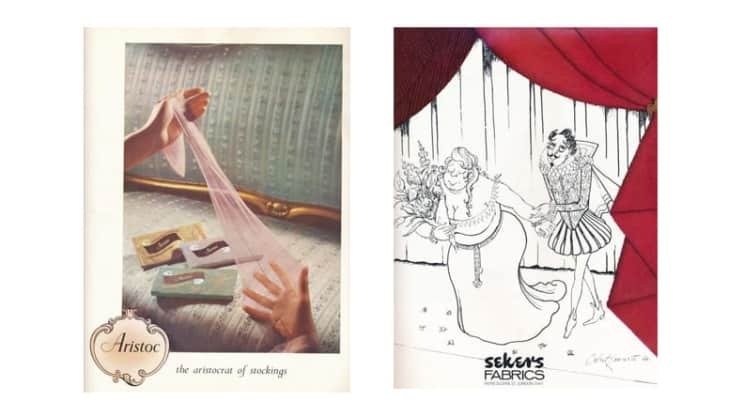 But Sekers was to provide much more than just fabric. This Aristoc advert appeared in the very first programme book in 1952. The Sekers advert appeared in 1966 edition of the programme book. Driving home with General Manager Moran Caplat from the Edinburgh Festival in 1951 after the last Glyndebourne performance, talk turned to how further sponsorship or guarantees could be found to help keep Glyndebourne going. Sekers had not long returned from the fledgling Aix-en-Provence Festival, bringing with him an elegant programme book, filled with advertisements. He put it to Caplat that Glyndebourne could do something similar, but better. Full page advertisements only, charged, not at commercial rates, but at a level that would provide real support to the Festival. Sekers calculated that it would only take 40 advertisers paying £500 for a page to bring in £20,000, close to the level of support provided by the Treasury for the Festival of Britain season. 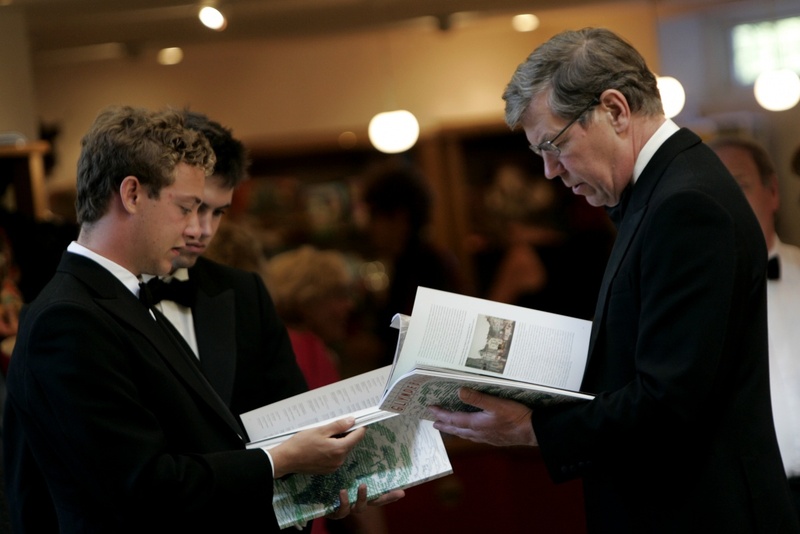 Printing costs could be covered by the sale price, this in itself a new concept for Glyndebourne, where programmes had always been provided free of charge. The idea snowballed, the Christies gave it their backing, and within a week Sekers had secured the first eight advertisers – the Glyndebourne Festival Programme Book was born. What followed was a carefully orchestrated drive by Sekers to secure further support for Glyndebourne at a series of parties for the great and the good. The result of those luncheon discussions was the idea of a membership scheme – that advertisers should get some kind of a stake in Glyndebourne in return for their page fee – but then, why not open the idea up to individuals as well? John Christie had believed as early as 1945, that hundreds of people would be happy to covenant a small amount to support Glyndebourne’s vital work. The Glyndebourne membership scheme was inaugurated at the end of November 1951. Givenchy (1990), Coutts (2003). The Twinings advert appeared in the 1984 Programme Book as part of a 20-page pull out where a hand opened every page. Inspired by some of the theatre clubs in London, three separate membership categories were agreed upon; Corporate, Individual and Associate, each carrying special privileges and priorities in booking, and an executive committee, chaired by Lord Wilmot, was established to administer the members’ interests. Inextricably linked as they were, the Glyndebourne Festival Programme Book and the Glyndebourne Festival Society shared a formal press launch on 6 December 1951, just three months after that fateful trip from Edinburgh. The success of the new scheme was clear to see; the first Programme Book proudly carried the names of the 24 Corporate and 66 Individual Members, acknowledged 700 Associate Members, and included 18 full page advertisements, all of which went a long way in helping John Christie with the cost of maintaining the Festival Opera. All vintage adverts have been scanned and reproduced from old Programme Books. Advertising in Glyndebourne Programme Books.